Seriously!? The "issue": Adolescent male grooming products and not enough cabinet space. 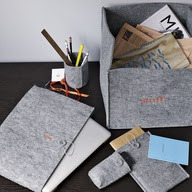 The "answer": Felt storage! I embroidered this one on my sewing machine. The embroidery can be done by hand or decorate the container with paint or glitter...use your imagination! Then zig-zag (or blanket stitch, by hand) the edges. That's it! See?! I told you that it was super simple! Problem solved! For my studio to hold fabric and craft supplies. For my office to hold papers, magazines and even pencils! I can see them as cute containers for children's toys or art supplies! Heck, they could be baskets to hold stray socks! I was happily thinking of all of the fun things that these little boxes could be used for. Then, I hit on the Motherlode! I could make these containers with lids and they could be used to hold Christmas gifts! So, I figured out how to make a top for the container this morning. Don't worry, you'll see more of these on this site with complete directions and ideas for decorating them when it gets closer to the holidays! I can just imagine these cute boxes holding all kinds of things and being great for the environment because these boxes will mean no gift wrap! Once I got started, it was tough to stop. Thank heavens I had to go to work! (Really?! Did I just say that out loud?!) Poor cell phone....never stood a chance. In hindsight, I probably should have added the word "phone" or a monogram. Oh well, I can do that on the next one! Yep, I'm on a mission! IPod, IPad, Kindle, Nook, you name it! In fact, it was so much fun that I decided to knock off this next: Click this link to visit my Pinterest page!